Programmatic is changing the face of online advertising, but it's also the cause of much confusion and fear. Many agencies and marketers understand that they should explore programmatic buying for its efficiencies, but it's extremely challenging to explore it for campaigns without a clear understanding of what it really means. Everyone seems to have their own definitions. As the the #1 place for discovering and starting the buying process for programmatic inventory, in addition to buying direct from sites or through networks and exchanges, your friends at SRDS.com can help. 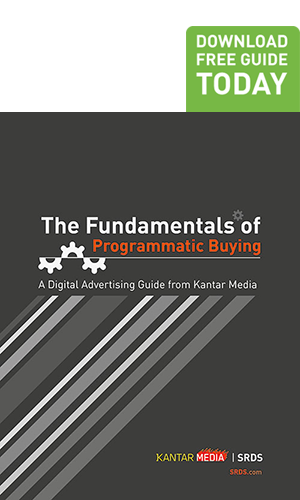 We've put together a friendly and authoritative primer on "The Fundamentals of Programmatic Buying." How to navigate the current digital advertising landscape. The fundamentals of programmatic buying. The benefits of guaranteed direct and private marketplace deals. How to use SRDS.com to research and initiate programmatic buys. Download your free guide to programmatic advertising now!